Johnson Estate is located in a special microclimate along the shores of Lake Erie, similar to that found in Germany. As a result, the grapes grown and wine made in Germany - Rieslings, Pinot Noir, and ice ones - are exactly the ones which also do well here in western New York. Johnson Estate's Winemaker Jeff Murphy, travels to Europe every year or two and often comes back with some new insights or "discoveries" which are utilized in our products or events. These have included: the terracotta bottles used for our Ruby Port and Cream Sherry; the glass corks manufactured in Germany and now used on our Freelings Creek wines, and the idea of serving "Fedderweiser", a partially fermented grape juice, for a fall Riesling celebration. In Germany, spring festivities feature "Maiwein", or white wine punches with strawberries and a handful of the shade-loving herb, sweet woodruff (shown here, behind the bottle, just emerging for spring). Jeff was inspired by the annual celebration of May Day in Germany to create Johnson Estate’s own May Wine, using estate-grown Vidal Blanc wine and an infusion of dried sweet woodruff. This sparkling May Wine was first released in 2016 and since the "experiment" was so well-liked, production was doubled the following year. Our current plan is to release, each spring, a limited vintage of this special wine. . But What is Sweet Woodruff? In Germany, sweet woodruff is called “Waldmeister” or the “Master of the Woods”. It is a spring blooming perennial plant which thrives in moist woodland shade. In the Middle Ages, it was known as an herbal medicine since the dried leaves contain coumarin and infusions were used as a spring tonic and even as an aphrodisiac. When dried, the herb has the long-lasting scent of freshly mown grass and vanilla. The dried herb has been used for centuries as a strewing herb, for pot pourri or as a perfume ingredient, as a tonic in tea, and an ingredient in German May Wine or a punch made with white wine, this herb, and strawberries – to celebrate the coming of spring. See May Wine product listing. 2018 East Meets West Wine Competition. The multiple accolades for our favorite Sparkling Traminette are, we believe, well-deserved. It is an elegant and delicious wine, complementary to a wide variety of food, ranging from appetizers to desserts. So, just what are estate wines? Why is it important to know? 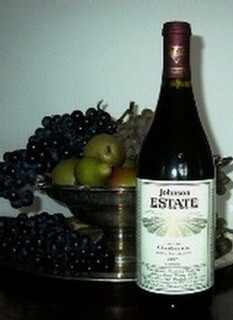 Why does Johnson Estate include it in its brand/name? Producing estate-grown and bottled wines is analagous to the French phrase "mis-en-boteille en chateau" - wine bottled at the estate/chateau. "Estate" wineries, which have a financial interest and own the vineyards AND the winery provides incentives to maximize quality of grape production, not quantity, and thus gives the winery in question some good advantages and attributes. The U.S. government, through the Alcohol, Tobacco, Tax and Trade Bureau (known as the TTB), sets the requirements for wineries that want to use the word "estate" on their labels. Estate-labelled wine must be made from grapes either grown on land owned or controlled by the winery. Those grapes must be in the same viticultural area as the winery. The winery must crush, ferment, and finish the wines - bottled and aged - on the winery premises. Thus, an "estate winery" is one whose operations are vertically integrated to include farming/growing of grapes in vineyards owned by the winery, wine-making, and bottling. As an estate winery, Johnson Estate's vineyard practices are wholly integrated into the production of its wines, and quality, rather than quantity, is the governing principle from bud to bottle. "ICE Wine - How Sweet It Is"
Quince trees (Cydonia oblonga), of the apple or “pome” family, are native to the Caucasus mountains of Georgia, Armenia, and northern Iran/Persia. The hard, sometimes fuzzy, fruit is apple or pear-shaped and the green skin becomes bright yellow when ripe. Its whitish-yellow flesh turns a beautiful ruby color when cooked. Quince fruit is high in pectin and has a unique sweet-tart, floral flavor which is perfect in preserves, jams or jellies, and quince paste. Known as “dulce de membrillo” in Spain, quince paste is a thick, sliceable jam, often served with Manchego cheese. Fred William Johnson was an orphan from England who immigrated to Saskatchewan at the age of 14 and worked as a cowboy until making his way to Cornell in the late 1800’s. He bought the farm in 1908, planting orchards of cherries, peaches, apples, and pears. He grew quince for his own consumption and both Fred Sr. and Fred Jr., founder and current owner of Johnson Estate respectively, grew up eating poached quince. Although quince trees were popular in England and the colonies, quince orchards are now somewhat rare in the United States. Fred and Jennifer Johnson have planted three varieties: Van Deman, Orange, and Aromatnaya, providing quince not only for Fred’s dessert with cream, but sufficient quantities for Jennifer to make quince paste to pair with cheese and wines and to sell in the winery. With a small knife, gently pry the quince paste out of the glass jar and onto a plate or cheese board. It will hold its shape and may be cut into slices to accompany cheese or charcuterie. In Spain, quince paste is traditionally served with Manchego, a salty sheep’s milk cheese, but the paste is delicious paired with a large variety of hard and soft cheeses. Serve as dessert with cookies or crackers; pair with Johnson Estate Vidal Blanc. There is a story behind this event. Last year, Jennifer saw one of Brenda McCutheon's origami "stars" at her booth at the Westfield Farmer's Market. After some discussion of the possibilities, she commissioned Brenda to make ornaments for the winery Christmas tree using cream cardstock and the winery's old labels. The new ornaments make the live Christmas tree (grown and supplied by the Knapp family who live nearby) a deserved focal point in the tasting room for the month of December and a source of pride and delight as we upgraded the winery's made-in-China "ornaments" for something much more meaningful. Yes, we've asked Brenda to make extra ornaments which we will be selling in the winery so that you may have one too! Christmas hors d'oeuvres and wine pairings - not enough for dinner, but a nice pre-dinner start! Thoughtful and customized gift sets and baskets for friends and family. Flights of Ice Wine - and enter your email for a drawing to win a deluxe ice wine gift basket - just in time for New Year's. Gift wrapping and a calligrapher to make that gift tag just right. We hope that you can join us. No reservations necessary. One of the summer's best stories is that we had been sold out of Vidal Blanc Ice Wine for some time and were looking forward to the bottling and release of the 2016 vintage. Winemaker, Jeff Murphy, had already entered sent some wines in the 2017 San Francisco Wine Competition, but knew that he wanted to include Johnson's 2016 Vidal Blanc Ice Wine - and as it had just been bottled, he had to ship it to California via overnight Federal Express to insure that it arrived in time for the wine judging June 30 - July 2. Are we glad that he did! The 2016 Vidal Blanc Ice Wine was awarded 97 Points!!! "Bright yellow straw color. Fruity aromas and flavors of grape jelly, wild lemon, and preserved peach with a round, crisp, fizzy, off-dry light-to-medium body and a seamless, medium-length roasted nuts, dried pineapple, and cream soda finish with coating, silky, soft tannins and a suggestion of oak. An exemplary sparkler with terrific effervescence and a nuanced approach to Vidal Blanc."